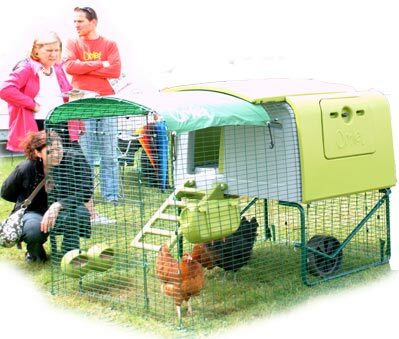 There are two regular cleaning jobs you will need to do if you keep chickens. 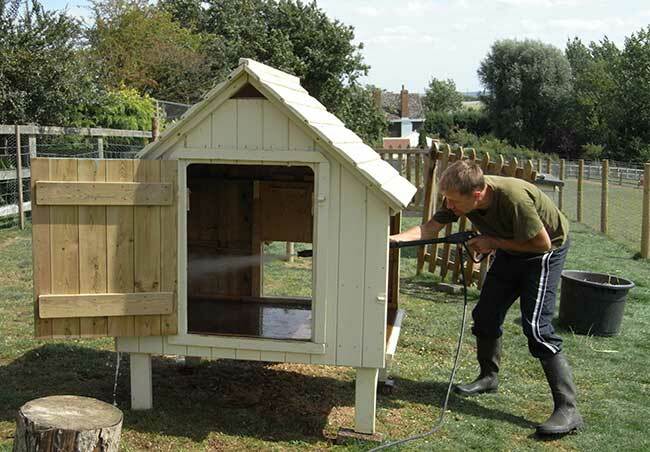 The chicken house will need cleaning out and depending on your setup (the size of your run and how ‘free range’ your chickens are, the chicken run may need regular cleaning. This is usually a weekly job, although you might need to do it more often. Sometimes a quick mid-week clean is required in warm weather, or in the depths of winter when the chickens are inside more than usual. Follow your nose, but if the coop starts to smell of ammonia, a clean-out is well overdue! Ammonia is produced by stale droppings, and will affect your chickens’ delicate respiratory systems. They do most of their droppings at night, so cleaning-out is a job that shouldn’t be neglected. If you keep on top of things and are well-organised, it needn’t take very long. Remove perches and droppings board. 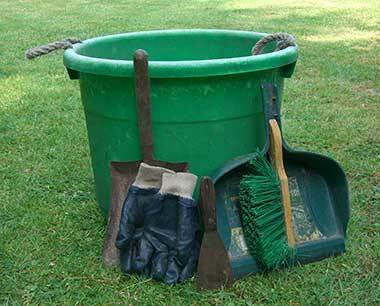 Shovel all the bedding into your bucket. Don’t forget the nest-boxes. 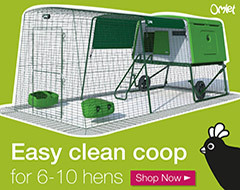 They shouldn’t be dirty, but the eggs you eat are laid in there, so the cleaner the better! 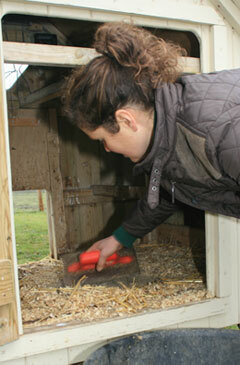 You can re-use unsoiled nest-box material on the henhouse floor. Use the scraper to remove dried on droppings from the house, droppings board and perches. Brush up all the remaining debris. You’ll probably find some feather dander around, but piles of grey dust (like cigarette ash) are a sign of red mite – proceed to ‘Spring-cleaning’ below without delay! Once the house is clean, poultry disinfect powder is useful for drying up damp patches. In fine weather, try to leave the doors open for a couple of hours so the house can air. Chicken bedding makes good compost. Just make sure the chickens don’t have access to the compost heap, or all your good work will be wasted! Finally add fresh nesting material and a layer of bedding. Replace the droppings board and perches. You could now give everything a spray with mite powder, or liberally sprinkle Diatom all around, rubbing it well into the perches. Remember that it will only work if it comes into contact with the mites. Johnsons Clean ‘n’ Safe – a cleaner and disinfectant. 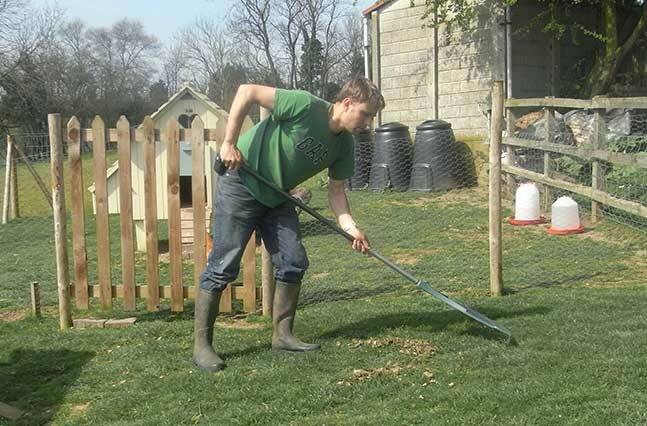 Diatomaceous Earth – for dusting around the coop afterwards to prevent red mite. Biolink Poultry Shield Cleaner Concentrate – dilute down to wash the coop and kill off red mite. That’s all there is to it – job done for another week! If your chickens live in a static run for all or part of the day, it can easily become a haven for disease. Worms have an amazing life-cycle, much of it based around droppings, so regular poop-picking can help keep your flock healthy. The smaller the run, the more often you need to pull on those rubber gloves! In dry weather, droppings can be raked up. Lining the run with a substrate like hardwood chips, sand or even rubber chips helps avoid the mud/dust bath usually associated with small chicken runs. It also makes cleaning easier and minimises smells. Regular use of poultry disinfectant and ground sanitiser will keep down disease and destroy worm eggs before the chickens eat them. Depending on the weather and the substrate used, you will have to change or clean it every so often. Take this opportunity to sanitise the ground beneath – or if the surface is concrete, to hose it down and use some disinfectant. Spring is a good time to scrub out the chicken-house, but don’t limit it to spring – an autumn clean gets rid of any nasties before the challenges of winter. You will also need to do some serious scrubbing if you suspect red mite or other parasites have moved in. Choose a warm, dry day and start early so everything can dry thoroughly. Take the house apart as much as possible. Remove all the bedding and scrape up droppings as usual. 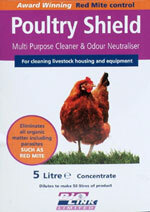 Poultry Shield is an effective cleaner that also destroys red mite. It’s very safe to use around chickens (although it shouldn’t be sprayed directly on the birds). 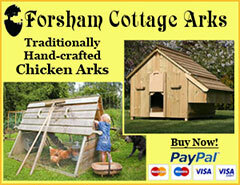 You can buy Poultry Shield online here. Mix up a solution as directed on the container, and get to work with your stiff brush. 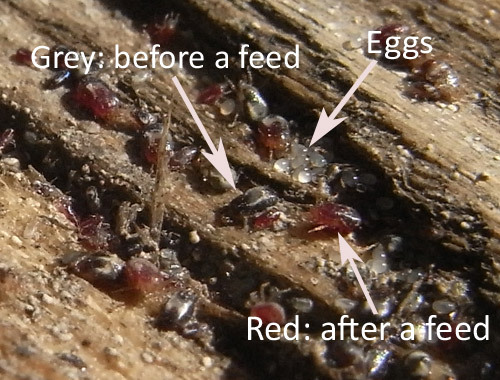 Use a sprayer to get the mixture into the crevices where red mite love to hide. Now leave everything to air and dry in the sunshine. The UV from sunlight kills many pathogens so it’s always a good idea to leave the door of the coop open to get some sunlight in once in a while. As chickens sleep on perches, ‘floor litter’ is the technically correct term. Whatever you call it, you need something that absorbs moisture, provides some insulation and doesn’t produce dust. Dust-extracted wood shavings are absorbent and help insulate the floor of the coop. 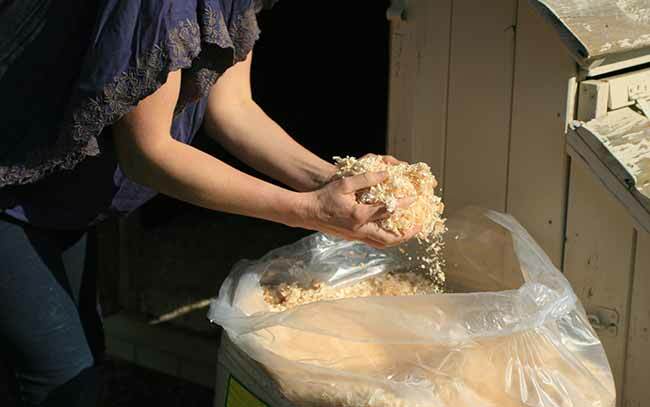 Dust-extracted shavings are absorbent, can help with insulation, and are also relatively cheap – large bales are more economical than bags if you have space. Shredded hemp is more expensive but much more absorbent than shavings. With good insulating qualities, it is dust-free and also repels flies. 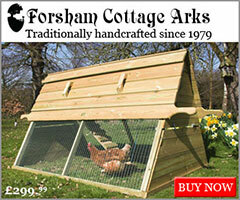 ‘Easichick’ is a wood product made especially for birds. It is dust-free, absorbent, and composts easily. Straw is dusty and not very absorbent – dust-extracted chopped straw is better. Shredded paper doesn’t give much insulation or absorption, and can be messy in windy weather! Shredded cardboard is absorbent, dust-free and composts easily. Don’t use: hay or shredded bark, as they contain harmful spores. Sawdust is too dusty and can cause eye irritation and can be a recipe for disaster since chickens are prone to respiratory problems. When bark gets damp (in the bag or in a run) it can go mouldy and cause mould spores to be released into the air. This can cause aspergillosis, a respiratory infection. Is it safe to use agricultural lime in the coop, then shavings and straw on top ?? It can burn their feet – so it is better to keep birds out for a few weeks so the lime can be absorbed into the ground first. We are moving to a house in the country and I am keen to keep chickens. A fairly large portion of the garden is gravel under olive trees. Would this be a suitable area for the chickens to free range during the day time? I don’t see why not. Chickens like some tree cover, just like their ancestors the original Jungle Fowl and shade during hot weather is essential. If you can place water in the shade, this will help them too. Hi, so in your opinion, is t not really necessary to use cleaners,etc in the weekly clean? You seem to be suggesting just clear out, air, then re fill with bedding and DE, then do a big clean once a year. I’m new to this and I’ve been spraying and scrubbing every week – would rather not, if I can get away with it! Mud is a problem. It will cause worms (it’s the ideal place for worm eggs to develop) and be unpleasant for you and your chooks. The best solution is to clean away the mud, and then put a few inches of hard wood chippings down on the ground. These rinse through easily, will last for a few years and when they do get mucky, can be removed and replaced. Do not use bark chippings, they must be hardwood chippings. Bark can harbour mould spores which causes respiratory problems or worse.You can usually buy hardwood chips in tonne bags delivered which is more cost effective than buying them in 20Kg bags from a garden centre. I clean out my girls poop daily from the coop, I have three chickens. I also clean out the poop at about 11:00pm at night before I go to bed. They have never used the roosting poles, preferring to sleep snuggled up together. Is this alright? They are very tame and let me do this no problem. Yes, this is fine, some prefer not to perch, although if they are roosting in the nestboxes then they will soil them and you don’t want that where they lay their eggs.